Nyaruguru, Rwanda, 1994 — A visibly pregnant woman makes her way home, desperate to retrieve baby clothes and food for her toddler son. 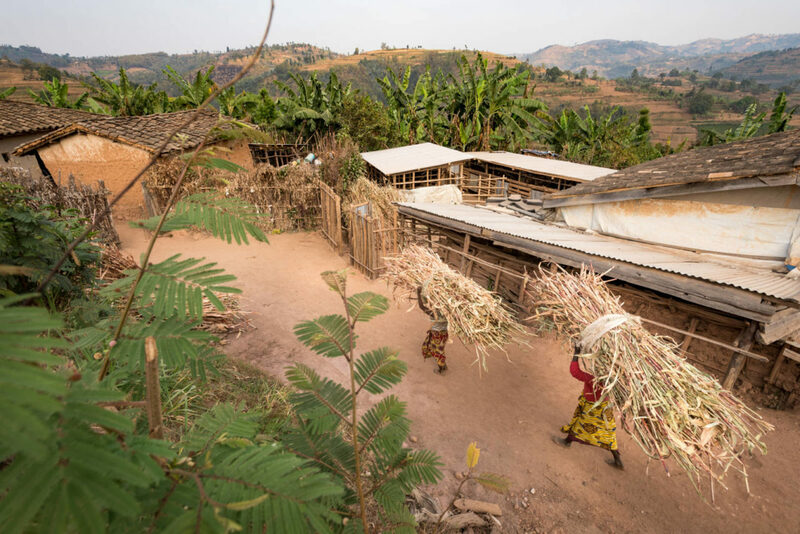 Her family has been sheltering with neighbors, moving from one location to another, after fleeing the Hutu uprising against the ruling-class Tutsis. Suddenly she runs into members of the militia — the Interahamwe, which loosely translated means “those who work together.” “Work” is code for using machetes to kill Tutsis. That “not-very-important” woman was Beata Bajyanama, now 52. She and her husband, Vedaste Nyumvira, and their son Emmanuel were displaced for two months as violence spread across the country. Today, an unprecedented 68.5 million people around the world have been forced from their homes, according to the U.N. refugee agency, UNHCR. 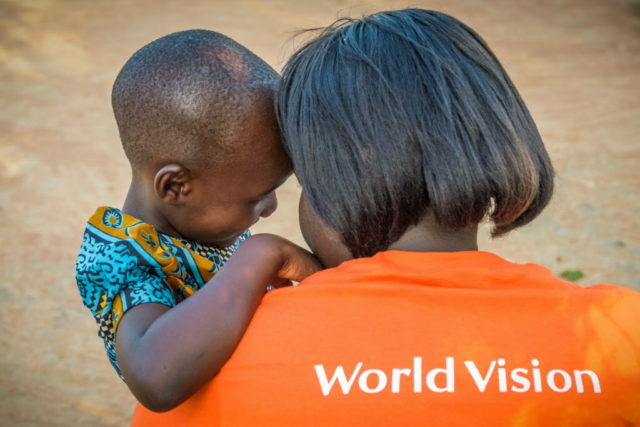 The stories World Vision hears are of people at a low point — driven from their homes, fleeing for their lives. But what happens after the crisis? 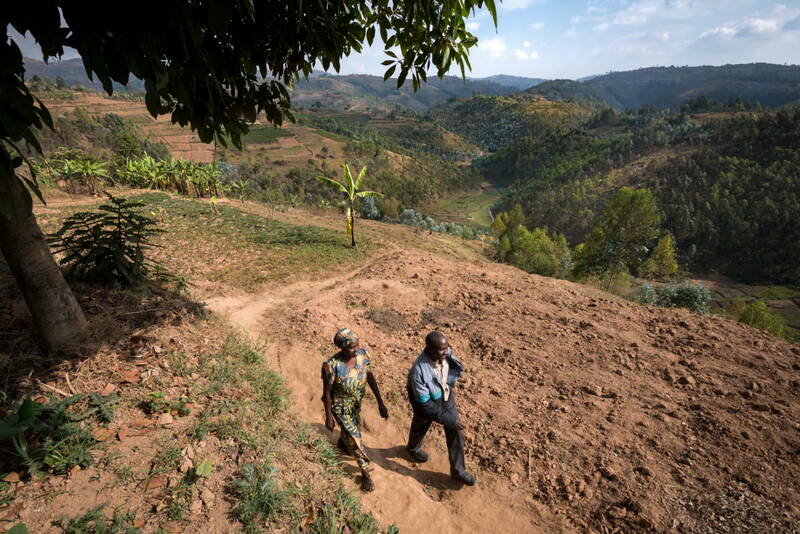 In Rwanda today, 24 years after the genocide, people have moved beyond trauma, beyond mere survival. Now they’re weaving a tapestry of hope through empathy and shared knowledge as they work together to improve the lives of current refugees, displaced people, and others in need. Beata believes God saved her for a purpose: to become an agent of change in her community. In 2011, government ministers from the repatriation program approached Beata about providing sewing training to returning refugees. She jumped at the opportunity to help. So far, Beata has taught 82 people to sew, including 15 returning refugees who went on to open their own shops. Brigite Mukunsanga was one of the 15. Brigite, 38, can testify to Beata’s importance. Her face lights up as she greets Beata with a tight embrace. 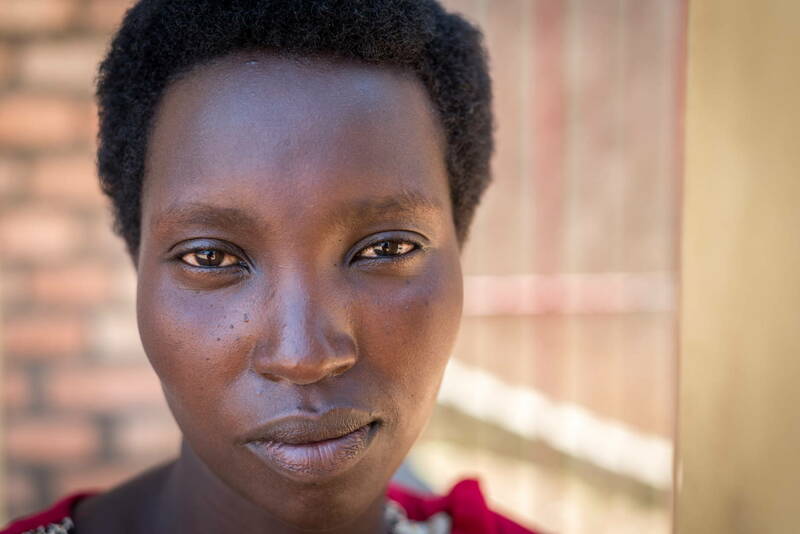 Brigite returned to Rwanda in 2012 after years of living as a refugee in the Democratic Republic of the Congo after her family fled the genocide. Her brothers were killed as the family ran. Her parents died in exile. 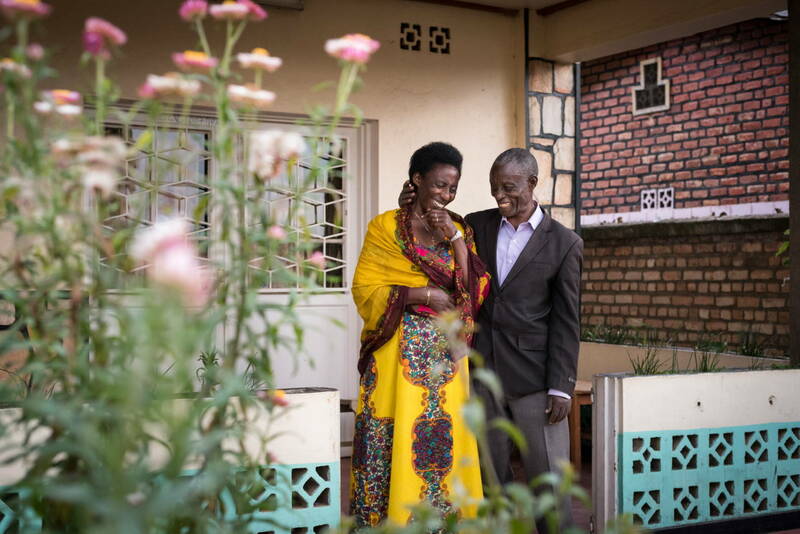 When Brigite and her husband learned about the Rwandan government’s program to repatriate refugees, they returned to Nyaruguru, where his family originated. Most of the family’s farmland now belonged to others, so what little land remained only provided sustenance for them. They had no income. 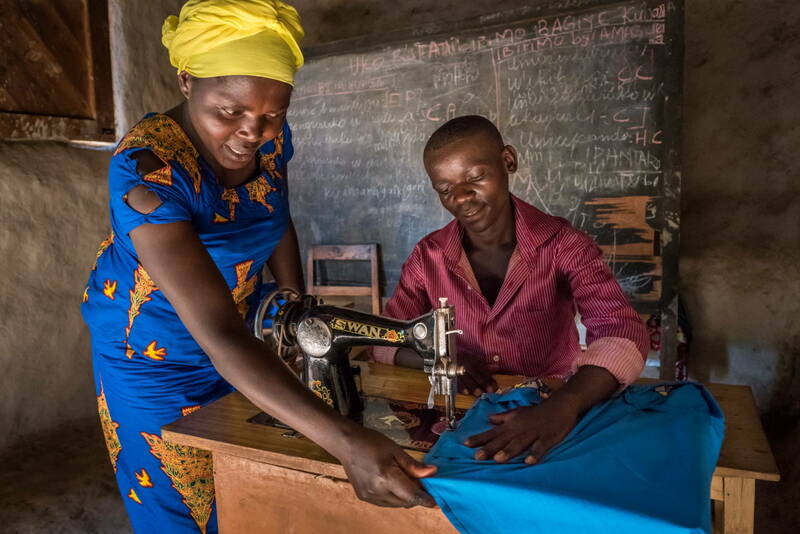 Brigite was eager to try the sewing classes so she could earn money to support her family. In 2014, she took a five-month class from Beata. After that, Brigite interned with Beata for a month. “For me, [the training] is a gesture of love, and I am thankful to her because it has helped me a lot,” Brigite says of Beata. 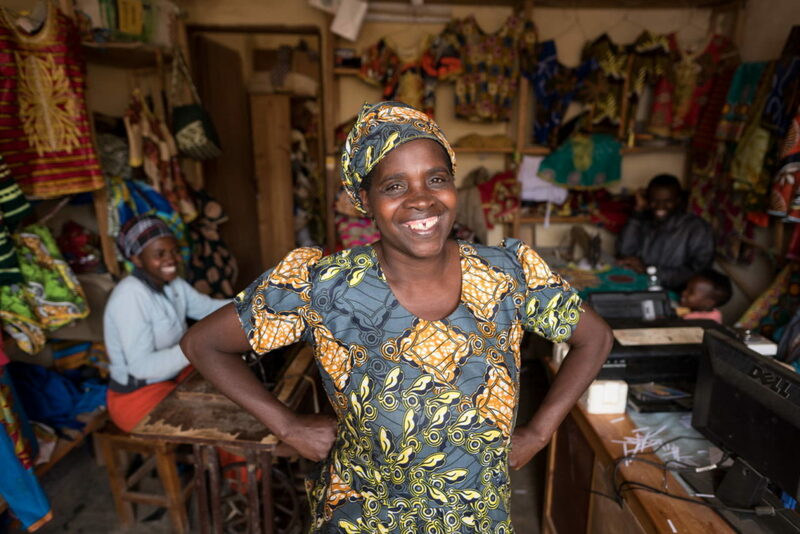 Brigite now owns a shop called Ejoheza — “bright future” — named for her renewed hope. She has stitched her thread into that growing tapestry. In 2015, the government asked Brigite to train a group of Batwa men and women. The Batwa, a minority tribe, tend to keep to themselves on the outskirts of society. But this community is eager to engage by learning sewing skills and quick to absorb Brigite’s instruction. So far, Brigite has trained 14 people, following in the footsteps of her mentor, Beata. Beata’s journey to recovery was an arduous one, fraught with heartache. 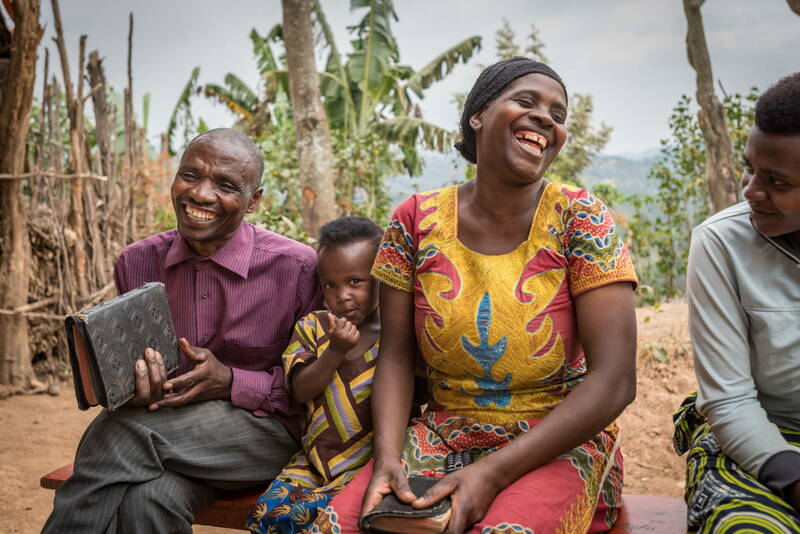 When she and Vedaste first resettled, Vedaste wanted to farm, but he struggled, only managing meager harvests. During the dry season, he couldn’t get water to his crops. When it rained, torrential downpours washed his hard work down the steep hillsides, sending their plants down to the valley below. “We were working in losses,” Vedaste says. Six more children came along, which meant more mouths to feed. The children would cry from hunger. And after complications during Beata’s third pregnancy, which nearly killed her, she couldn’t breastfeed her babies. “It’s very painful to see your child crying because they don’t have food,” Vedaste says. It made him more determined to improve his harvests. 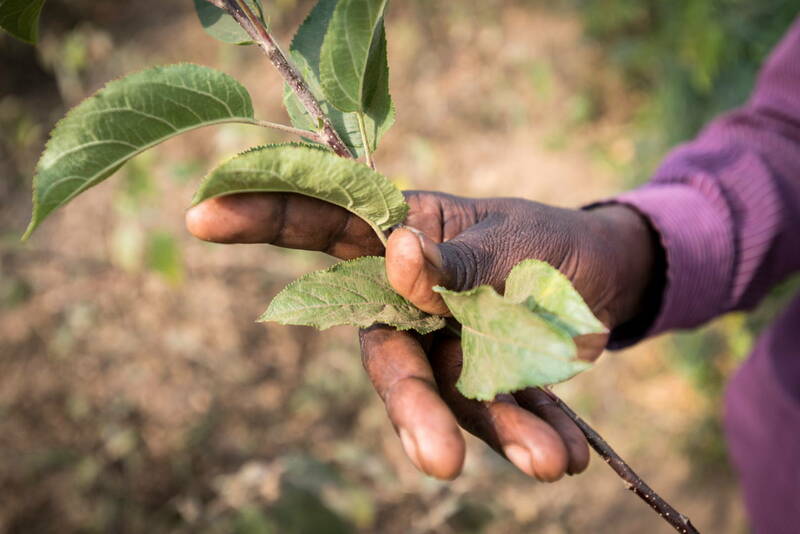 In 2010, he began learning new farming techniques from World Vision through a program made possible by child sponsorship funds. 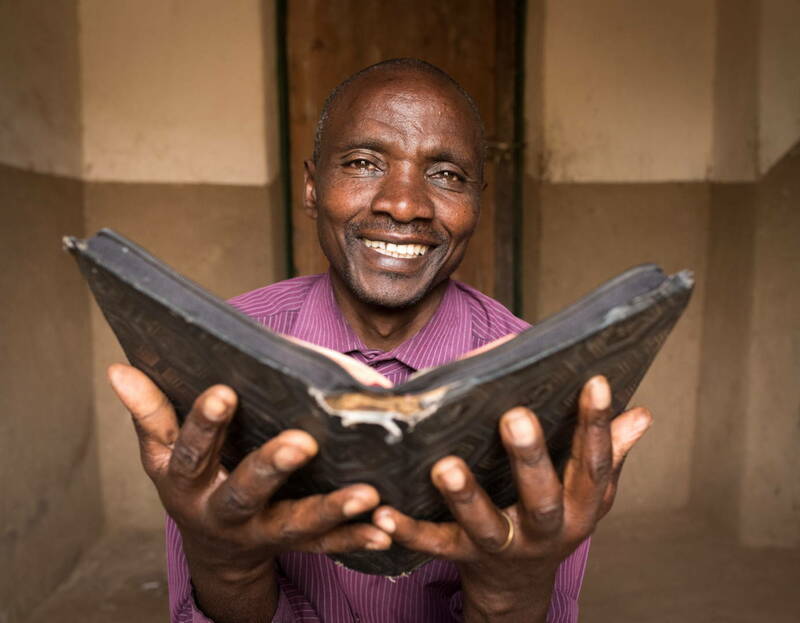 Emmanuel was sponsored, which acquainted World Vision staff with the family’s struggles. 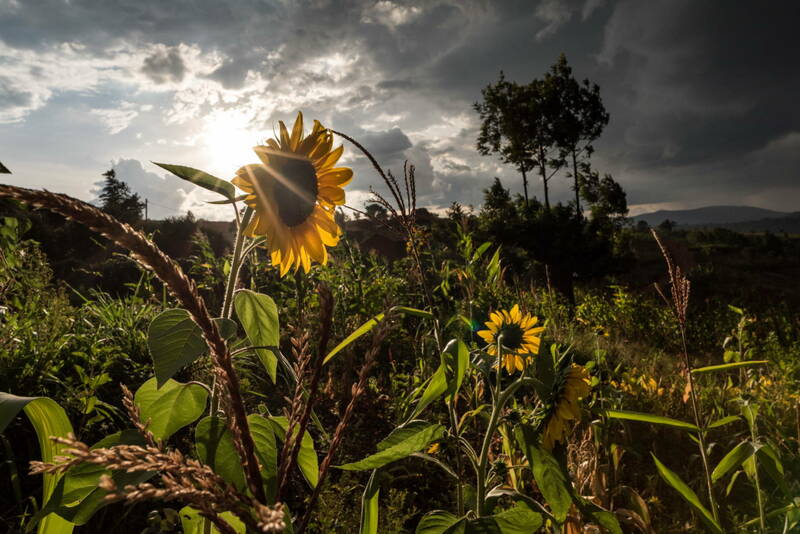 Vedaste was selected in September 2014 to participate in a new agricultural program called Inzozi Nziza — “good dreams” in Kinyarwanda, one of Rwanda’s primary languages. 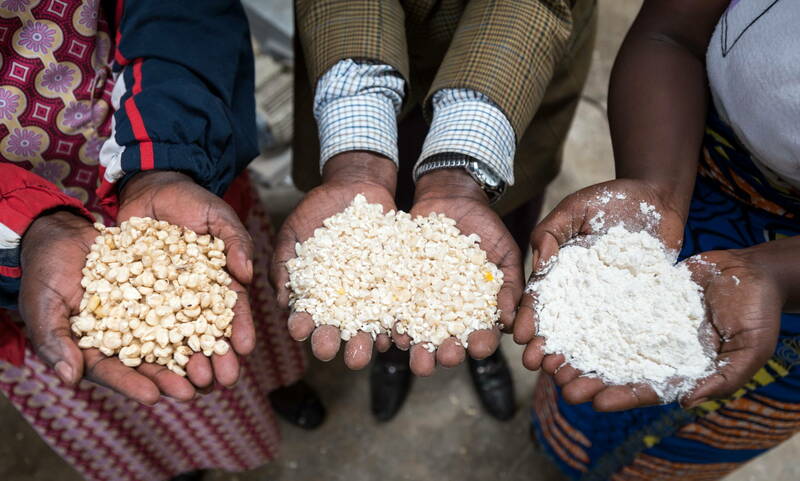 This program paved the way for World Vision’s signature economic empowerment program, THRIVE — Transforming Household Resilience in Vulnerable Environments. As part of THRIVE, Vedaste traveled to Yatta, Kenya, to learn advanced agricultural techniques from Bishop Titus Masika. There, Vedaste met farmers earning the equivalent of 30 million Rwandan francs (US$38,000) per year. He saw the possibilities. One onion farmer inspired Vedaste to try his hand with the bulbs; after the training, he was so eager that he stopped on the way home to buy onion seedlings. He applied the farming techniques he’d learned — improved fertilizer and drip irrigation. Through THRIVE, Vedaste learned about the importance of diversifying income sources, so he planted a variety of crops. Beata diversified too — starting a tailoring business she’d dreamed of for years. She began by renting a sewing machine from a friend. With her early earnings, she bought her own machine. Then she connected with VisionFund, World Vision’s microfinance subsidiary, and took out her first loan of US$125. She bought another sewing machine. VisionFund staff trained her to use the money efficiently. The team also prayed with her that the loan would result in a positive impact on her family. After four loans and repayments, Beata has purchased 10 machines. Now, most days she’s inside her shop. The whir of sewing machines fills the air. Colorful fabrics line the shelves. Three of her grown children work alongside her, embroidering patterns on women’s dresses or sewing school uniforms. In months that include orders for 100 school uniforms, the shop can earn up to US$590. Another of her sons runs a newly purchased photo printer as the family continues diversifying their economic opportunities. Beata has become a successful entrepreneur. She and Vedaste have secured a better future for their children, and they are also sharing their success with others in need. He opens a rusted metal door behind the cow and pig pens. The view is like the one Dorothy sees when she opens her front door into the wonderful world of Oz. The land is covered with a bounty of fruit trees — banana, orange, avocado, apple, and lime — as well as crops of sugar cane, pumpkins, spinach, peppers, and passion fruit, to name a few. The plots are pieced together like a patchwork quilt of chartreuse and sage, forest and kelly green. Just off the main path, a few workers weed and clear rocks from an area freshly planted with carrots, onions, and cauliflower. They can earn money doing this job, but they also gain knowledge they can apply to their own fields. Eucalyptus trees line a steep, switchbacking path to the valley below where sweet potatoes grow. Everything stretching from the house to the sweet potato fields belongs to the farmer who talks to the animals. Things didn’t always look so colorful for Israel Nsengiyumva, his wife, Margaret Nyirahuku, and their seven children, who range in age from 24 to 38. During the 1994 Rwandan genocide, they spent a month hiding near the outskirts of the Nyungwe Forest. They returned home to discover that all their possessions had been stolen, leaving them to start from scratch. But when World Vision child sponsorship began in Mudasomwa in 1999, their lives began to improve like Vedaste’s and Beata’s. Now, Israel and Margaret have plenty for their golden years. By selling fruits, vegetables, meat, and eggs to local restaurants, Israel has provided a nice nest egg for their family. 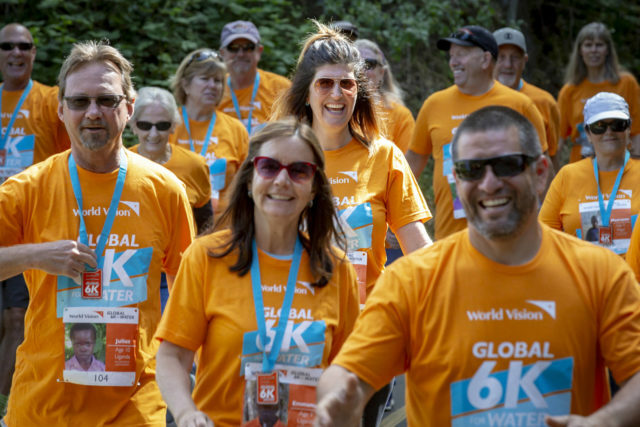 “One of the most important things is World Vision opens my mind,” Israel says. 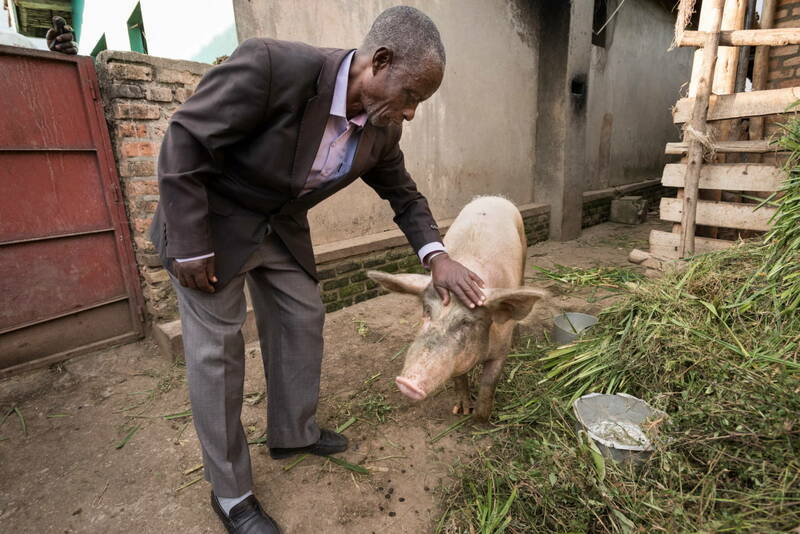 “Now I know what to do with my farm.” He wants to share that mind-expanding knowledge with other farmers, so they can improve their families’ lives too. As a model farmer, he does just that — opening his home and fields twice monthly so others can learn. 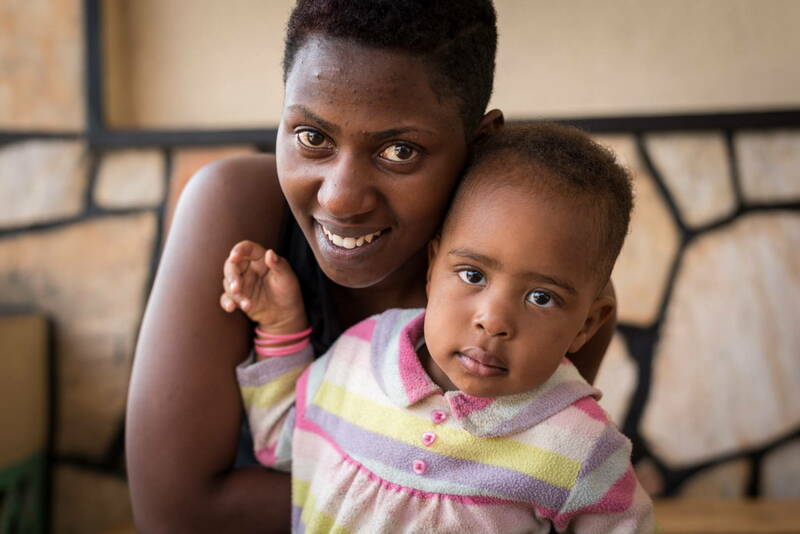 Now Israel has more than enough to provide for his daughter Marry Grace Kabatesi, 24, and granddaughter Tessy, 2. Israel is also involved in two local ventures. He sells his corn crop to the Akezakanyamagabe Corn Processing Plant, which began operations in September 2016. 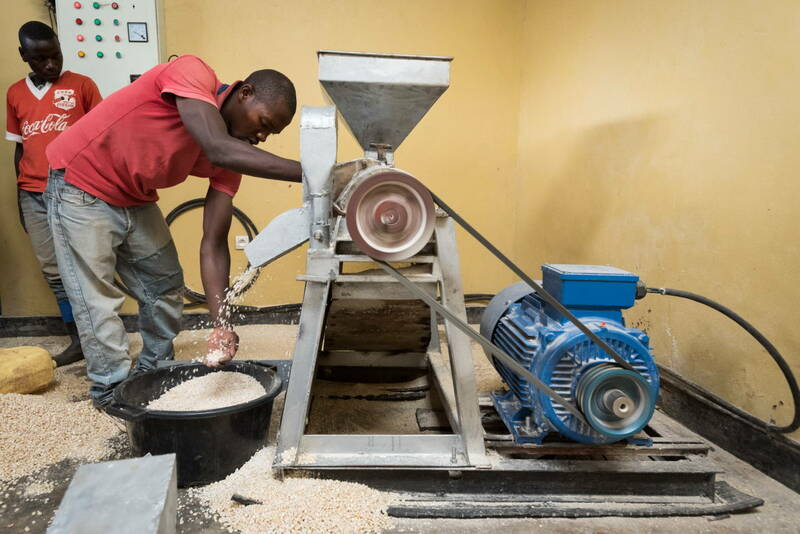 World Vision helped Israel’s savings group start this commercial venture so the community would no longer have to spend money every month renting a car to go buy corn flour. Now, they produce it from their own crops. At first, the cooperative produced three tons of corn flour per week. Now, they make that amount in a day. Members earn US$3,660 per month, and they hope to increase their output to five tons per day soon. They’re expanding outside their own community, too, selling corn at Gasarenda Market near Kigeme refugee camp. Established in 2012, this camp of small homes roofed with iron or plastic sheets is home to thousands of Congolese refugees. In December 2017, the UNHCR reported the camp was home to more than 20,000 inhabitants. 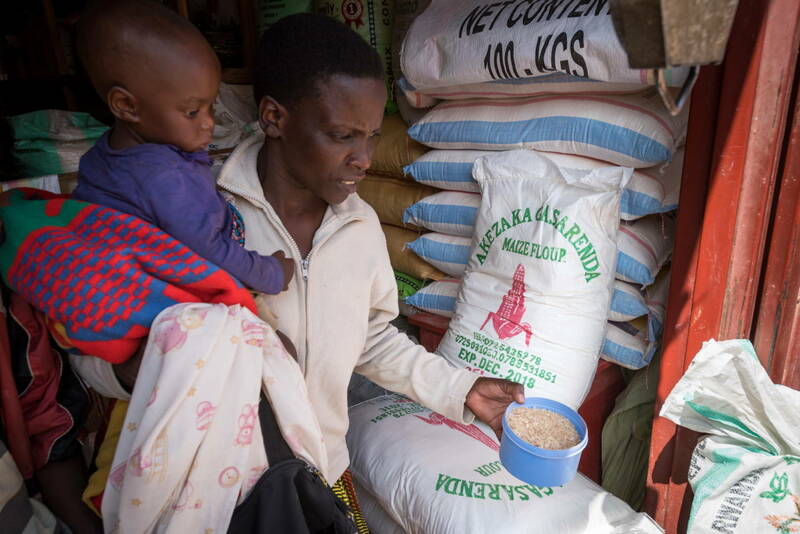 The corn-flour cooperative benefits the Kigeme refugees because they no longer have to spend money traveling long distances to buy this staple food. And they know that because of the processing plant’s association with World Vision, the flour is of reliably high quality. As someone formerly displaced, Israel is happy to be able to assist refugees. He says, “As a blessed person that has been helped by God, I am obligated to help these people. Another opportunity for Israel to offer support is through the sale of milk to the nearby Tare Milk Collection Center. In 2014, World Vision worked with a community group to build the collection center. This sponsorship-funded venture gives farmers a place to sell their milk that assures them of fair compensation and timely pay. Before, they’d struggled with dishonest middlemen who often cheated them or didn’t pay on time. World Vision helped the staff secure a contract with the refugee camp. As with the corn flour, refugees knew they could count on the milk’s quality and a reasonable price. Collection center workers in white overcoats line up silver milk containers on a sparkling white tile floor. They’re marked for delivery to Kigeme. Angelique Furaha, a 32-year-old mother of five, has lived in Kigeme camp for five years. 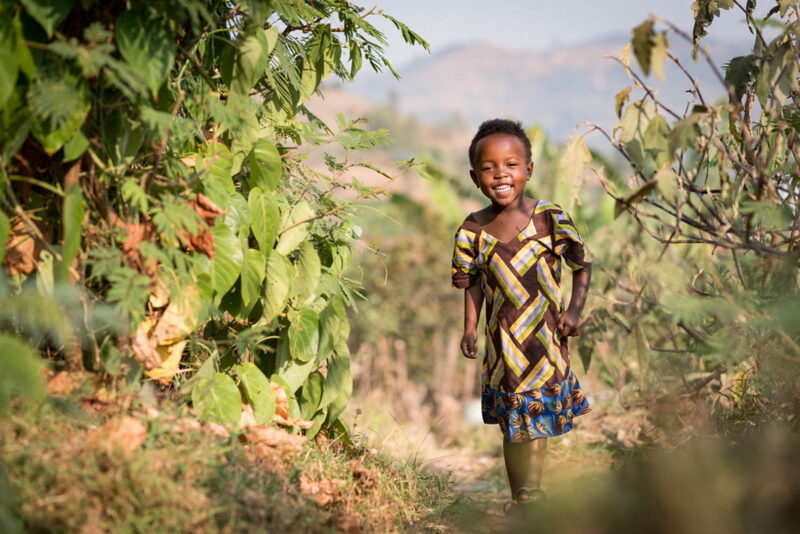 Before she fled the encroaching violence in the DRC, she sold milk from her own animals. Angelique Furaha, 32, sells milk that is processed and delivered from the collection center at her shop in the refugee camp. The Tare staff also wanted to find a way to give back to the community. 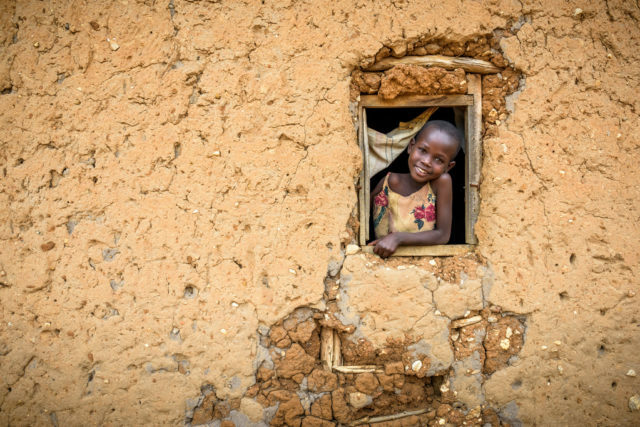 Seeing many malnourished children around the center, and knowing World Vision focuses on children’s well-being, they came up with a great solution. They decided to serve coagulated milk — a cross between buttermilk and yogurt — as a way to provide nourishment to the children. 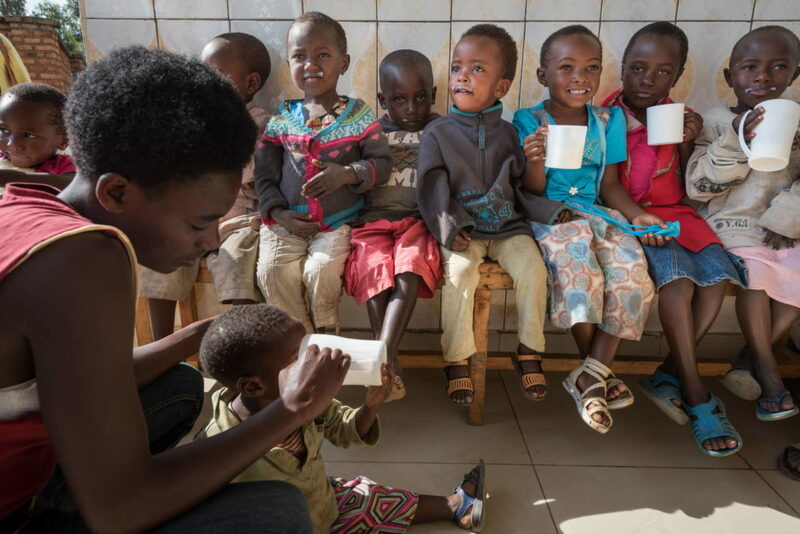 On any given day, the same staff members who receive the farmers’ milk can be found serving the nutritious drink to malnourished children identified by World Vision staff. The children line up on a bench, their feet dangling in the air. They each drink eagerly from a colorful cup, giving them a charming milk mustache. As a father once powerless when his children cried out in hunger, Israel feels fortunate to be able to braid a thread of hope into the lives of vulnerable children. The foundation of World Vision’s economic empowerment program is a biblically based empowered worldview. People learn that they are created by a loving God who has given them much potential and responsibility for themselves, their families, and the environment. Israel expresses this through his tenderness. “When you show love even to the plants and the animals, it will give back that love, and it will respect you, and it will produce,” he says. 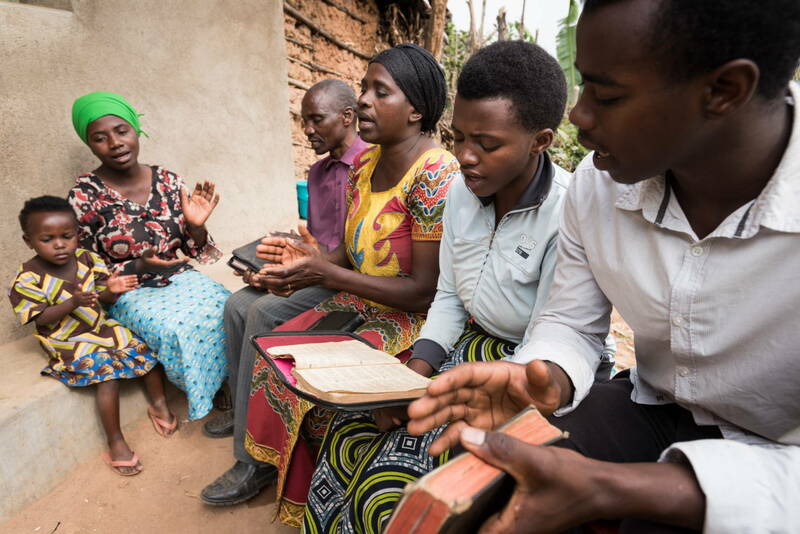 For Vedaste, that foundational teaching first bore fruit when he returned from his Kenya training with a renewed belief in the power of prayer. “When we were there, we were told how people change because of prayer and applying the Word of God,” he says. Emmanuel — the baby who stopped crying when the genocide bullets began flying — remembers his father also came home from the training encouraging the family to treat each other with love and respect. Vedaste pulls out a well-worn Bible and begins to read: “Whoever dwells in the shelter of the Most High will rest in the shadow of the Almighty. I will say of the Lord, ‘He is my refuge and my fortress, my God, in whom I trust’” (Psalm 91:1-2). Those verses are favorites for Beata. They remind her of God’s faithfulness during the genocide, through the hungry years, and now as they serve others. At church, they met a single mother who struggled to feed her children. They sympathized and offered to raise her youngest child, Claire, who was showing signs of malnutrition. Now 5, Claire is growing stronger and is in school. She’s learning English greetings and numbers. Claire’s life would be very different had Vedaste and Beata not been there with bounty to share. The pain and heartache of being driven from their homes make Beata, Vedaste, and Israel uniquely empathetic to the struggles of refugees and displaced people. They’ve taken their suffering and transformed it into beauty by helping others. They offer hope that the world’s millions of currently displaced people will one day sew their own patterns of giving and love into life’s tapestry. 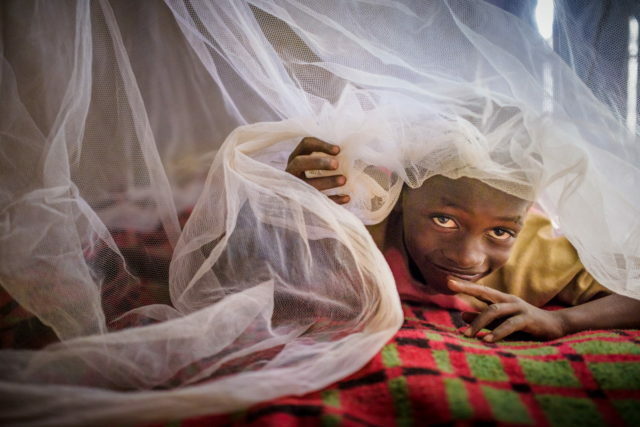 Jimmy Gahima, Anaïs Nyiramahogazi, and Charles Rwomushana of World Vision’s staff in Rwanda contributed to this story. Help hardworking families flourish and thrive.